Football used to be the popular sport of Bangladesh — once. Many would remember the Abahani-Mohammedan rivalry that dominated our sports scene in the 70s and 80s.Aided by a dedicated fan base and corporate patronage, at the height of their rivalry, the clubs even recruited foreign players to bolster their chances to win the Dhaka Premier League. The term ‘Dhaka Derby’ was initiated to denote a match between Abahani and Mohammedan. The passion ran so high that often there were fights between the fans in the stadium and around the nation which led to fatalities. Unable to cope with profound grief and insult, inflicted by their team’s defeat, few dejected fans even took their own lives. The Bangladesh Football Federation (BBF pronounced as BAFUFE in Bangla) was not proactive to curb the violence nor to educate the scorer fans to handle their emotions, and limited actions were taken against team officials who fuelled this fever. Although regulations against such acts were there the BBF lacked courage, will and support to apply them — and much less so against the two giants Abahani and Mohammedan. However, the ‘Dhaka Derby’ excitement did not survive beyond the post-independence decades, due to poor management of football, conflict between the football officials and organizers and the rise of cricket. Bangladesh’s cricketing success on big stage contributed heavily for dissolution of football, as football glories were limited to competing against the South Asian Association for Regional Cooperation (SAARC) giants, mainly India and to lose in the world cup qualifying rounds. Still, the popularity of cricket was not solely due to the downfall of football. As part of British India the earliest recording of the sport played in Bangladesh dates back to 1792. In the period following liberation, Bangladesh suffered a shortage of cricket gear and infrastructure. However, cricket did not stop and Bangladesh played its first international match against the visiting Marylebone Cricket Club (MCC) in the December of 1976. Based on MCC’s post-tour report and previous meetings with former Bangladesh Cricket Control Board now Bangladesh Cricket Board, the International Cricket Council (ICC) granted Bangladesh the associate membership in 1977. A few other foreign teams, notably from India and Pakistan, also toured Bangladesh during the same period. In 1979, Bangladesh played their first ICC Trophy. Wining the 1984 South-East Asian Cricket Conference Tournament led to Bangladesh playing in the 1985 Asia Cup. This progress successfully installed the dream of achieving ODI status, and test status, further down the track. (This summary is adapted from the referred websites below). Around this time popularity of football had reached its peak and started to wane. The football clubs had started to get involved in business and beyond (there were rumours of club level gambling). The hooliganism in football matches was common, the national football team faced excruciating defeats in its only Asia Cup appearance in 1980, and the team performed very poorly in the world cup qualifier rounds (something which has not changed in the last 30 years). The high-margin losses encountered at the hands of much bigger teams enforced the idea that Bangladesh will never make it big in football. As television became more common, Bangladeshis were able to watch World Cup football and realised the mammoth gap that existed in standards of the country’s soccer and the quality sides. It was obvious that the style of playing football in Bangladesh was far behind the better teams, even the Asian teams. Fitness and physic were major issues. While these factors drove the spectators away, perhaps, the determining point was that football could not serve nationalism due to its inability to shine on an international stage. At the same time cricket consistently improved, both in the national and international scene. The sports-loving mass found a competitive sport with quality sportsmanship. Bangladesh went on to qualify for the 1988 Asia Cup, though it would be 1999 when we had won against a test-playing nation and gain test status. Taking part in all the successive ICC Trophies starting in 1979, Bangladesh emerged as the winner of the trophy for the first time in 1997, followed by an ODI win in 1998. Sadly, much of the passion from the glory days of football has continued. The security measures in the stadiums these days have reduced hooliganism, but the followers and their combative natures have joined cricket. If, now, they can not fight at cricket stadiums, they do so through the social media. Bangladesh’s terrible losses in cricket matches often result in angry facebook statuses that violate social norms of decency. I once heard about an incident, from an unverifiable source, about an obsessive fan calling up the model wife of a cricketer and scolding her for the poor performance of her husband. The incident would have been mildly bearable if the fan also called to apologize when the cricketer’s performance got better again. The psychoanalysis for this bizarre blaming remains a topic for another day. Another incident can be told about a cricketer getting into a hassle with a disappointed fan possessing a rough tongue. There was a time when the performance of the Bangladesh cricket team precipitated rapidly. The dismissal of the opener had almost immediately followed by the dismissal of the one-down batsman, as the entire batting line-up would fall down like a house of cards. The bowling attack was comparatively consistent, though it lacked the sharpness and agility of the present team. In recent years this has changed significantly. The wins have become more frequent and the losses less terrible. 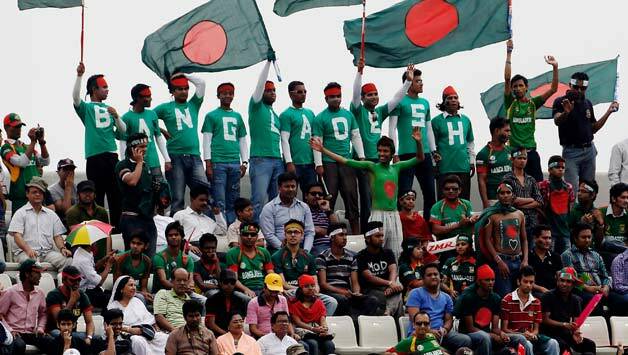 The support for the Bangladeshi cricket team has naturally become more consistent. Yet individual cricketers facing bad spells receive no mercy: whether it is Tamim Iqbal with his dry batting spell or Shakib Al Hasan with his less-than-good leadership. Criticism is understandable, but more often than not, the response is bordering bullying. A few cricketers have had responded in a less- than-gentle manner to this bullying, which is equally condemnable. Also, let’s not forget the vulgar language with which we address other cricket teams as that is indecent too. The love Bangladeshis have for their cricket team is tremendous, but our reaction to the ups and downs of our cricket team goes beyond the usual valobasa. It points to an ultra-nationalistic culture and ‘flag-waving’. We love our country and we’d love to serve it, but as most of us can not directly be involved in serving the country, some of us may have the tendency to resort to flag-waving. In the context of cricket, this flag-waving consists of our hooray’s and boo’s. Cheering for the Bangladesh cricket team for its tiniest success and criticizing it severely for its utmost failures gives us a fulfilment. We are doing our bit — lauding our eleven cricket gladiators for their success and crucifying them when they fail. But how important is our praise or our curses to keep cricket alive and well? Professional excellence and an unwavering commitment to the game of those involved would likely to be far more important to the future of the sport. BCB is most organized and professional out of our sporting bodies. The availability of sponsorship and the popularity of the game have made its work a lot easier. And do we need to care about other sports? Football, hadudu, volleyball, hockey, gymnastics, shooting, swimming, tennis deserve attention and funding, even if, their viewer-ship is low and are likely to be low in the near future. The individuals who play these sports are sportsmen with passion for their game. Much like the guys who had played cricket in its early days — they know they are not going to earn much money but it is solely the love of the game that keeps them going. I am not saying cricketers don’t love their game but the financial prospect definitely makes it easier. We also need to treat cricket (and other sports) as a game and not a chance to avenge past misdeeds. Like our beloved captain Mashrafe Bin Mortuza said, “our heroes are our freedom fighters not the cricketers”. It is foolish and hypocritical to assign the duty of carrying the flag of the nation to our cricketers. We have no right to put such a burden on them — while we sit back in safety of our homes and expect them to fight our wars, for us, against our enemies.